Tanks for bulk storage, mixing, plating, etc. Tank and tank auxilliary items including tank fittings, pumps, valves, stands, vents, level controls, alarms, gauges, and many related liquid handling products. 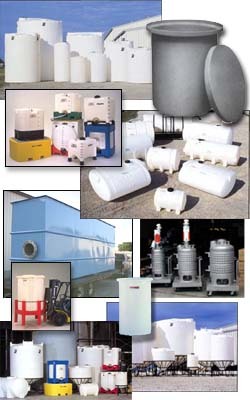 DeWallace Technical provides tanks for industrial and commerical applications. Photo's show some of our typical tanks. DeWallace Technical specializes in providing tank and auxilliary items for your industrial chemcial, pure water and environmental applications. We have tank fittings, pumps, valves, stands, vents, level controls, alarms, gauges, and many related liquid handling products.